It’s a universal question. But what are the primary concerns in other parts of the world? Very different, it seems – and yet in many ways the same. A team based at the University of Sheffield, in partnership with the University of Leeds, and operating under the project name INTERSECTION, has taken its home city as a starting point for posing questions about intergenerational issues and attitudes. It has then transferred the same questions and research methodology to two other mid-sized post-industrial cities: Jinja in Uganda, and Nanjing in China. The research takes the form of parallel surveys, interviews and discussion groups, plus public discourse analysis using leading newspapers, in each country, to yield quantitative statistical data on the one hand, and opinions and personal narratives on the other. The principal focus is on attitudes towards consumption, sustainability and the environment. This work has been completed in Jinja, nearly completed Sheffield, and is well under way in Nanjing. In another branch of the project – steered by Jane Plastow, Professor of African Theatre at the University of Leeds – INTERSECTION has shaken off the rigours of pure academic research to initiate community theatre projects in all three cities, permitting volunteers from different generations to explore and act out their views, grievances and prejudices about intergenerational issues. This process helps to bring attitudes into the open for discussion, and provides a means to seek and promulgate solutions. The work is revealing some fascinating differences. China, for instance, has a rapidly ageing demography, yet strong intergenerational traditions: “respecting the old, caring for the young”. Uganda, by contrast, has one of the youngest populations in the world (nearly 50% are under 15 years of age) and traditional respect for elders is being undermined by the hand-to-mouth cash economy, social instability, unemployment, and the “BBC” divide between those “Born Before Computers” and the young who – despite everything – have access to the wider world of the internet. Three different generations took part in the community theatre work in Sheffield, performed (and filmed) in November 2015. The event was – to my my mind – remarkable for its theatrical inventiveness, as well as for the penetrating exploration of intergenerational issues in the post-performance discussion. In Nanjing, it seems that there is absolutely no tradition of community theatre, especially one that starts with ideas rather than a script. For the participants in the “middle-aged” group (26–41 years old), the sense of novelty, adventure and inventiveness in pursuing the programme – steered by Dr Canny (Chen) Liu – has been particularly exhilarating. In Jinja, the theatrical work – set in motion by anthropologist Dr Katie McQuaid – has been successful beyond all expectations, and the “We are Walukuba” group has continued independently, taking its plays about intergenerational issues, gender inequality, land ownership, waste disposal and recycling to other communities, local government and beyond. This exciting story will be revealed through a 45-minute film scheduled to be shown at the Festival of Social Science in Sheffield, on Tuesday 8 November. You can get a sense of it in advance from the INTERSECTION website. The full report will be complete in 2017, but the reverberations of this innovative combination of academic research and public involvement are likely to be felt for many years to come. 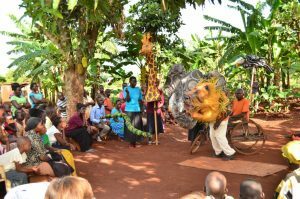 Image: Members of the “We are Walukuba” community organisation perform the roles of Snake, Giraffe, Elephant, Lion and Eagle in “The Kingfisher’s Story”, in Works Village, one of the poorest areas of Walukuba, in the city of Jinja, Uganda. Copyright Katie McQuaid 2016.